I am loving stuffed peppers! Their vibrance, simplicity and deliciousness are all key to making a healthy, satisfying and colorful meal. Picking pretty peppers at our local farmers market is one of my favorite activities. They are so much more affordable than grocery store peppers you see on the shelves, and, packed with even more flavor than those in the regular store, too! Peppers are the perfect (edible!) serving vessel. They stand tall and proud on their own, and can be stuffed with just about anything and still be delicious! 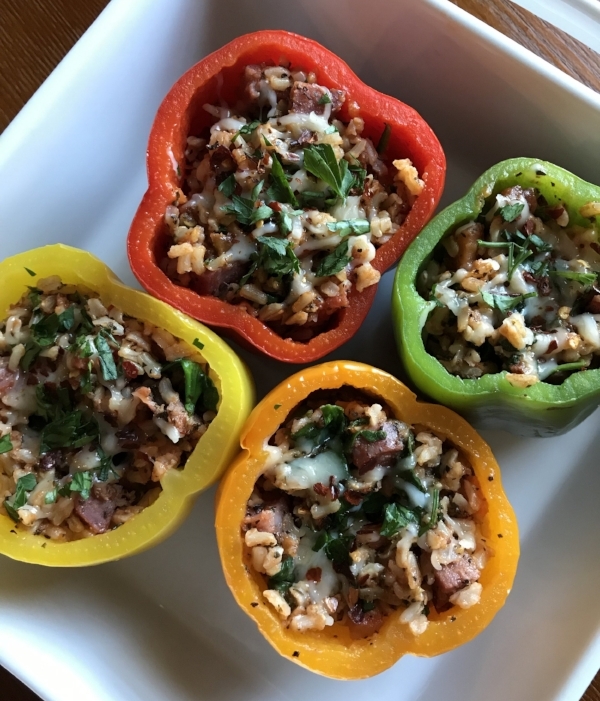 I recently partnered with Beyond Celiac to show just how versatile Boar’s Head products are, and I loved that they featured a gluten free stuffed pepper on their recipe list. I was inspired to whip up a batch of my own. The best part about Boar’s Head is that all of their high quality products, down to the meats, cheeses and hummus are completely gluten free! That’s right! COMPLETELY gluten free! They even sell their products pre-packaged in grocery stores so that you can find safe, on-the-go foods you feel good about eating. I was highly impressed with the stuffed peppers. They were filling, satisfying and such a healthy meal idea that is easy to work into the dinner rotation. You can even bake a batch at the start of the week and reheat them for dinners and lunches. Here’s my take on the classic stuffed pepper. Remove the tops and seeds from the peppers and set aside. Add the peppers to boiling water for about 4-5 minutes, until tender. Carefully remove from the water and dry them off. Place the peppers on a roasting pan, with the opening facing up. Set aside. Finely dice 1 cup of sausage. Toss with a few tbsp of olive oil and some chopped fresh basil. In a saucepan on medium heat, combine 2 cups of warm cooked brown rice with 1/2 cup tomato sauce and 1 tsp oregano. Add a few handfuls of chopped spinach and the sausage mixture, then cook until all ingredients are heated through. Mix in some shredded 3 pepper colby jack cheese and continue to stir until the cheese melts. Spoon the mixture into each of the peppers, filling them to the top. Sprinkle a little extra cheese on top. Place into a 350 degree oven until the cheese melts and enjoy nice and hot from the oven! This is a sponsored post by Beyond Celiac. All reviews and opinions expressed in this post are based on my personal view.